Desi Linden won the Boston Marathon Monday in 2:39.54, effectively ending the 33-year title drought for American women. 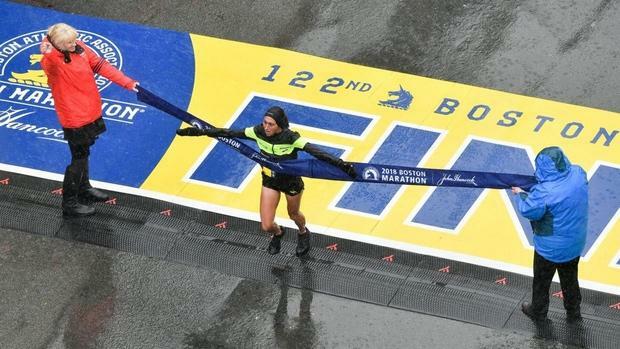 The conditions in Boston were amongst the worst in race history -- the temperature at race time was 38 degrees and 31 degrees with the windchill with heavy rain and 10 mile per hour gusts. "I don't have the right words," Linden said immediately after the race on the television broadcast. "I'm thrilled, it's supposed to be hard and I just want to thank John Hancock and the B.A.A. for giving me a chance year after year and believing in me when I didn't believe in myself." The last U.S. woman to win the country's oldest marathon was Lisa Rainsberger, who claimed the Boston crown in 1985. On Monday, Shalane Flanagan finished seventh in 2:46:31, Edna Kiplagat was ninth in 2:47:14 and Molly Huddle placed 14th in 2:50:28. The Michigan native, who represents the Hansons-Brooks Distance Project, is known as a gritty runner and was favored by some when the weather forecast turned south. But still, she was far from the favorite in a deep field that included Flanagan, the 2017 New York City Marathon champion; Jordan Hasay, the second-fastest women's marathoner in U.S. history who withdrew from the race last night; Huddle, a 26-time U.S. champion, and an international field led by defending champion Kiplagat of Kenya and course record holder Buzunesh Deba of Ethiopia. Linden did not take the lead until mile 22, but from there it was no contest as she ultimately won by five minutes over Sarah Sellers of the United States and Krista Duchene of Canada, who ran 2:44:04 and 2:44:20, respectively. The first half of the race saw various lead changes as the athletes actively did not want to lead and tried to draft off each other. The women did not run under six minutes for a mile split until the fourth mile, when Mamitu Daska of Ethiopia led the group through in 5:51, unofficially. Fellow Ethiopians Deba and Aselefech Mergia also spent significant time at the front during the first half of the race. Click here for mile-by-mile play-by-play of the 2018 Boston Marathon. Just before the 12-mile mark, Flanagan appeared to be communicating with Linden and fellow American Serena Burla. She pulled off from the pack and stopped in a port-a-potty for slightly longer than 10 seconds. Linden and Burla dropped back from the lead pack and when Flanagan reappeared from the bathroom, Linden ran side-by-side with her U.S. rival to rejoin the leaders. Burla, the only athlete in the front to wear a crop top and racing buns--most everyone else wore jackets--stopped at an aid station and grabbed either a plastic bag or poncho to wrap around her body. The lagging pace up front made it possible for Linden and Flanagan to rejoin the scrum fairly easily; Kiplagat led the group through Mile 12 in 1:13:11 with a 12th mile split of 6:13. But the half marathon mark is where Daska chose to make her move; she split 1:19:41 and within the next mile, put a 14-second gap on the field. She would lengthen the lead to excess of 20 seconds over the next few miles, as Gladys Chesir of Kenya, Kiplagat and Linden formed a chase pack and the other top Americans, Huddle and Flanagan, fell back. By Mile 17, Chesir and Linden dropped Kiplagat and held steady in their quest to cut into Daska's 20-second lead. It was Heartbreak Hill just after 20 miles where Daska's reign would end. Before the hill, Daska led Chesir by 17 seconds; Linden was another eight seconds behind Chesir. Linden did not run under six minutes again for the rest of the race--her finish time would be the slowest winning time in 40 years--but it didn't matter, as Chesir and Daska had no answer to the surge and in fact, neither woman would finish the race. By the time she rounded the curve to Boyleston Street, it was clear that on her sixth try, Linden had won the Boston Marathon.